When Lucy found out the woman was Katita Waldo, a prima ballerina at the prestigious San Francisco Ballet, she instantly knew she wanted to photograph her. Katita introduced her to two other ballerinas who had just become mothers, Tina LeBlanc and Kristin Long, and she began photographing their careers and personal lives for what ultimately became the Balancing Acts series. Little did she know that the project would end up spanning 15 years. Lucy’s negative perception of ballerinas began to unravel as she encountered the high stakes of their decisions to have children. Since most ballerinas choose a career in dance by age 11 and begin dancing professionally shortly thereafter, they have little opportunity to develop other job skills. With the physical demands of both dance and childbirth, professional ballerinas who decide to have children are taking a major risk if their bodies are unable to quickly recover after birth — their livelihood is on the line. This risk, coupled with the demanding and stressful nature of professional dance, means it is both rare and quite brave for ballerinas to have children. The three ballerinas in Balancing Acts were at the top of their field when they chose to get pregnant, and motherhood was not easy. One battled crippling stage fright, another’s marriage fell apart. Each faced not only the stresses common to motherhood, but also the constant pressure to prove themselves in the highly competitive world of dance. Past achievements were no guarantee of getting cast in upcoming shows, so long hours of practice and attempting to capture and hold the attention of the ballet’s artistic director were a constant feature of their lives. Yet, instead of faltering, they succeeded. “After they had children, they all got to be better dancers, which was the biggest surprise for me,” she says. 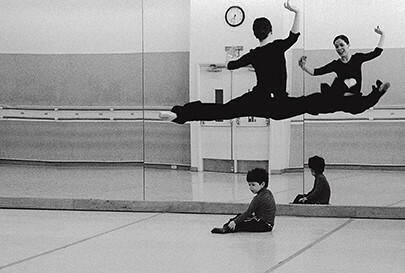 Photos from Balancing Acts: Three Prima Ballerinas Becoming Mothers by Lucy Gray, published by Princeton Architectural Press, 2015. Visit Lucy’s Photostream to view more of her work. The theme for last week’s #FlickrFriday was #UnexpectedDetail.